Almost twelve years ago (WHAT.) I got pregnant with my first child. At the time I was familiar with the idea of home birth since a number of my childhood friends had been born at home (I didn’t live on a commune, I swear! ), but I didn’t begin planning immediately for a home birth. It was a complex mix of insurance frustrations and doctors with poor bedside manners (to put it lightly) that led me to seek out a midwife around the middle of my pregnancy (one more parenthetical phrase. just for fun). Once you’re a part of the attachment parenting/home birth/La Leche League community, you tend to hear about certain things. Ina May Gaskin and the midwives of The Farm, for one. I was recently sent a copy of the new documentary Birth Story about Ina May and how she learned to become a midwife and how she inspired a movement. Before I go on, I want to make it clear that I know that not every mama is a candidate for an out-of-hospital birth, and that other mamas choose to birth in a hospital setting, and I’m so glad we have doctors to take care of those mamas. But there are more and more women who are making the choice to have a home birth, and there are quite a few women who don’t know they have the choice to make. 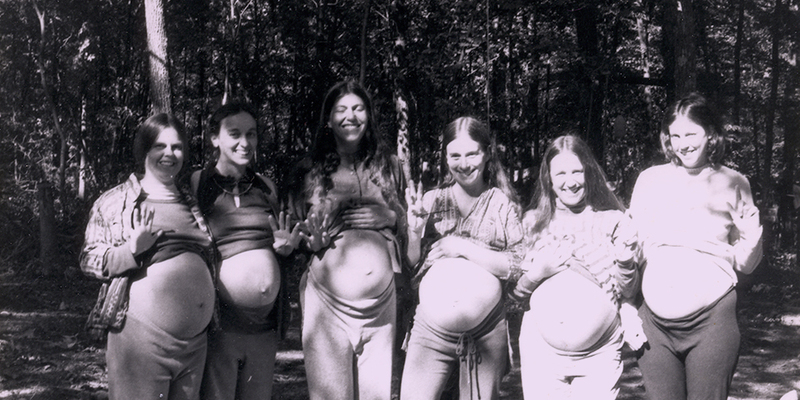 This documentary is a beautiful story of what midwife-attended birth is, how it became a movement in America, and the power of an intentional community. There is one awkward moment towards the beginning where Ina May is talking about her own history with birth and says something that felt less-than-inclusive to me. I mention this only because I don’t want to alienate mamas who might feel uncomfortable with the remark. I don’t know what the context was off-screen, and since she otherwise comes across inclusive, understanding, and loving, I assume that comment doesn’t speak for her as a person. In other words – don’t turn off the movie just yet! The midwives in this documentary are midwives I’d choose for my births. (In fact, they remind me of the midwife I did choose for my births.) They balance current science with trust in a woman’s body. Ina May says, at one point in the film, “Your body is not a lemon.” Indeed. They protect their mamas from stress, and encourage them to find their inner strength. They laugh with you and look you right in the eyes when you need focus. This film relies heavily on archival footage from The Farm’s history. Now, I may have an unnatural affinity towards 70’s fashion, and that may have played a role in how much I liked those old film clips, but they were also an integral part of the film. Through those clips, we get to experience a breech birth, see the Gaskin maneuver help a case of shoulder dystocia, and relive the beginnings of the community itself. Did you catch that? A breech birth. It was amazing, and I’m still high from seeing it 24 hours ago. There is a scene where they are sitting around talking about how their hair has gone grey, and what that means for a midwife. It means respect. Instinctively, we know that older women hold the wisdom. In most of our culture we’ve lost that understanding – we do everything we can to stay looking as young as possible. But the midwives of the Farm have discovered that they are trusted more once their hair turns grey. I find that fascinating. In the most ancient of female roles, we rediscover our ancient understanding that becoming old is beautiful. Your body is not a lemon. If you are interested in what midwives do, or the history of midwifery in modern America (and, in fact, the rest of the world, actually), I highly recommend this movie. But you don’t have to take my word for it! (Obligatory Reading Rainbow reference!) You can buy it on DVD or download it, or you can check the list of upcoming screenings to see if it’s showing in your area. Midwives are awesome! I had one with my first but unfortunatly was not able to deliver at home, but I am currently 19 weeks pregnant with my second and so far everything is looking good for a home birth! Very excited!! I want to see this movie. I read and re-read Gaskin’s books (particularly Spiritual Midwifery) while I was pregnant. I think she’s fabulous. My midwife instructed me to use the Gaskin maneuver while I was delivering my last guy and had a pretty severe dystocia. I’m still so grateful for that…if I’d been in a hospital, he’d have likely had his collarbone snapped. Thank you so much for spreading the word! I believe these movies/documentaries are a MUST for every person to see, yet sadly they aren’t publicized nearly enough. I had two home births (I was barely 18 the first time I gave birth). The most amazing experiences of my life! Ask me about birth… I just won’t shut up :) Birth Without Fear is another WONDERFUL blog, and there is a facebook as well. I’m from New Zealand and here a Midwife is the first choice for your lead maternity care. (Unless you have known issues or are high risk) their care is free and to choose a obstetrician costs around $5000 NZD. Midwives are trusted expects is birth and I have had a amazing experience with them for both my births. I choose the hospital just in case and for the birthing pool and no mess! but we had 2 natural intervention free calm births. Loved the holistic approach that birth is a natural thing, not a medical thing, they empowered me to do what my body was designed to do. Brilliant experience!